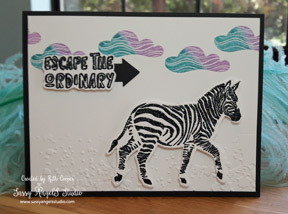 Escape the Ordinary Stamp of the Month – Welcome! Welcome to the new SASS Stamp of the Month Inspiration Project! Each month I will be featuring a stamp set and a project a week of inspirational uses for that stamp set to fuel your muse with creative ideas. Plus there will be an exclusive FREE project download for anyone visiting the SASS blog. If you live locally, there will be a Stamp of the Month class where you will get to create the 4 weekly projects that will be showcased on the blog. Check the date out on the Events page. Let’s take a look at the August exclusive download. Isn’t this a fun card? I decided to go with a classic black & white with a pop of color. Good for birthdays, travel, graduation, promotions or retirement. To claim your free tutorial click here. For future tutorials, I will be working on adding a landing page to my blog, but I needed to get this endeavor off the ground so for August this will work. I hope you enjoy this new feature. Stay tuned next week for the next card in this series. Find some time to be creative soon!